I was planning to muse about what it feels like to read a book a day but events derailed that idea. 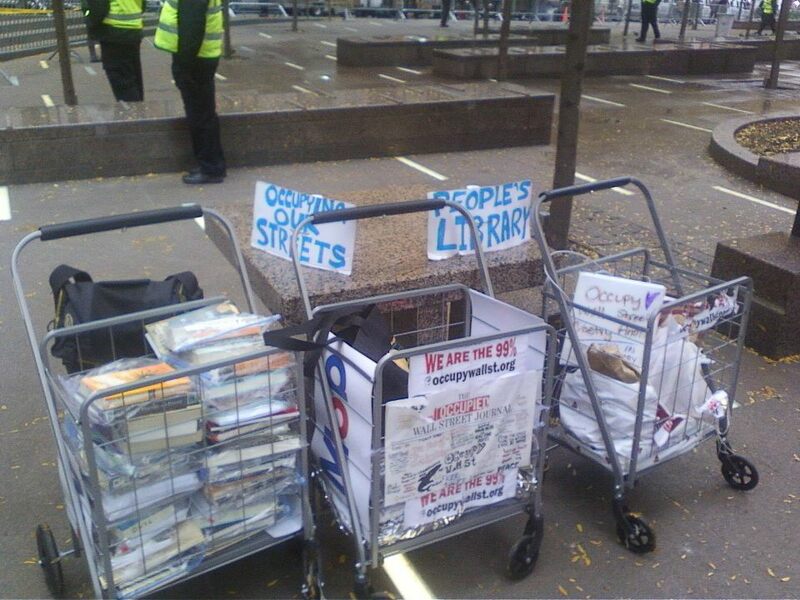 It seems that a free public library in a park needs to be dismantled in the dead of night by riot police and carted off by the Sanitation Department. 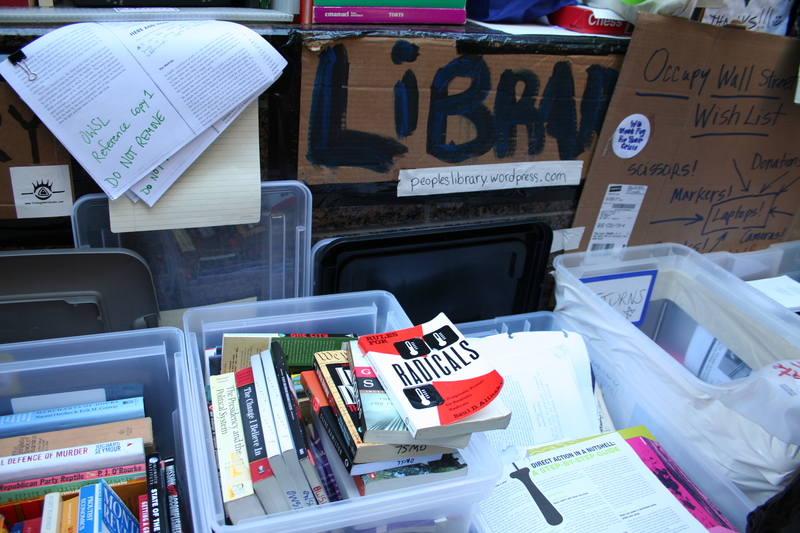 And then, after more books are donated and some few damaged volumes are salvaged, the free library should be trashed again. Very nice. Not exactly my utopian idea about a whole city that becomes a library. Not really defensible unless we are the barbarians after all. Once upon a time I thought that marching and protesting—and even voting–could change the world. 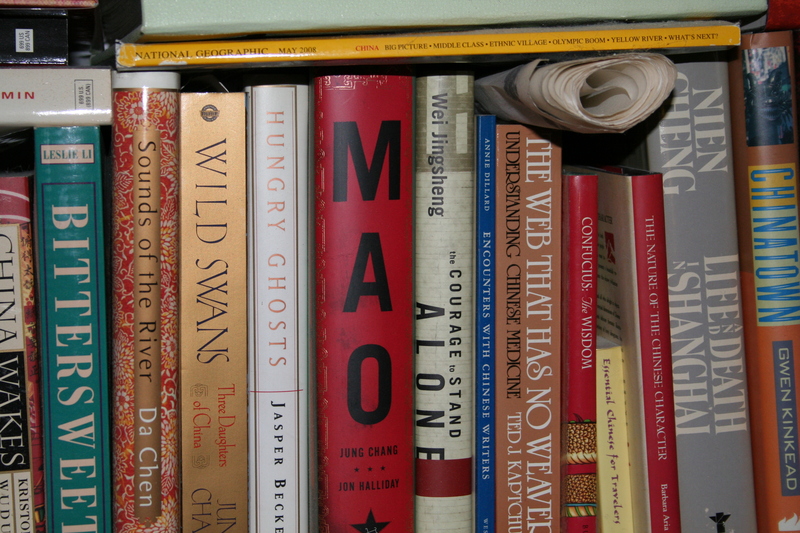 These days I read obsessively to change myself. 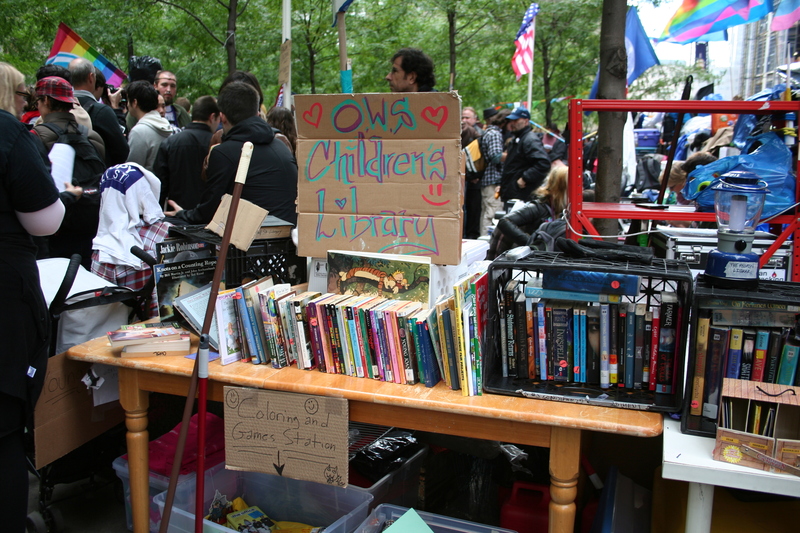 OWS new mobile People's Library--police won't let the books back into the park so they've taken to the streets with the protestors. Photo Courtesy of Occupy Wall Street. As I keep on opening books and turning pages, I have discovered that I’m still tempted to abandon a book midway if it isn’t a pure joy to read. By finishing books, I find a few treasures and some memorable ideas or characters or plot twists. I still feel guilty about reading as there is so much work to do and not enough work for pay and I always think I should be marketing more, hunting for jobs to apply for (exercise in futility but guilt assuaging), doing the laundry at the dismal, overcrowded Laundromat. (Glamorous Gotham is full of romantic prewar brownstones with no laundry facilities whatsoever and none allowed in individual apartments.) Everything, it seems, could take precedence over reading a book, which must be an act of pure self-indulgence. How can reading a book be essential? My answer to myself is that, in a society of barbarians, how could anything be more essential? Books capture the past, the present and the future. Books tell stories. Books create worlds. This one is slightly insupportable at the moment. So I can search for a better world, or ideas about how to make this broken world better, in every book I open. Reading is an exercise in hope. 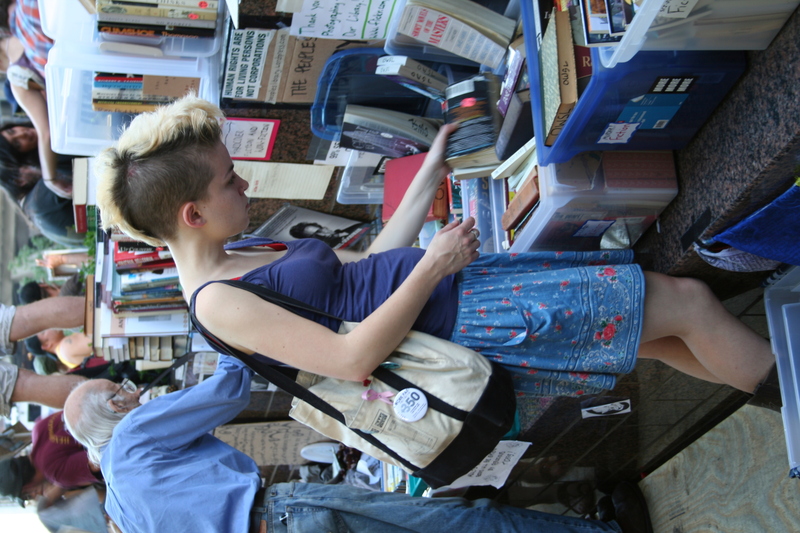 Haul away all the books you like in dumpsters. Scatter the pages of books like leaves in autumn. Convince yourself, as I did, that you don’t have time to read and dash on madly in your busy lives. Or let the laundry pile up now and then, serve cereal for supper, and feed your starving soul with the rich repast of a good book. It will give you something worthwhile to talk about over the cereal. A book might be your best weapon for keeping the barbarians at bay. It might change your life. It might give you hope. The book was stained, its pages rippled and dried after a soaking, some of them stuck together. An orange circular sticker had OWSL scribbled on it in black marker and so did the top of the book, across the edge of the closed pages. 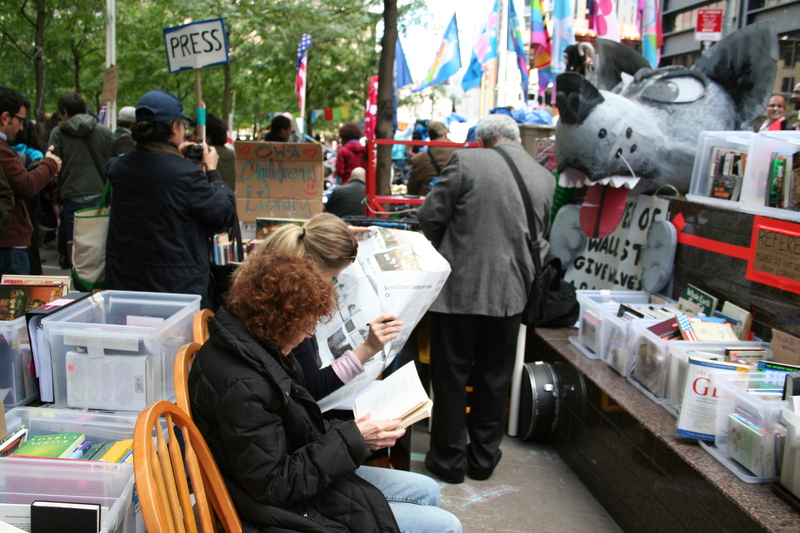 Whomsoever’s it was before, now it belonged to the Occupied Wall St. People’s Library in Zuccotti Park. Selected Translations, 1968-1978 by W.S. Merwin was still in one piece and I like Merwin’s poems so I picked it up to read it. I could have taken it home; one guy was worried he wouldn’t have time to finish a Lawrence Block book before he had to return to Phoenix so a volunteer librarian told him to take it with him and donate it to Occupy Phoenix when he was finished with it. I read Merwin on a convenient wooden chair in the park because I thought I might read some of these daily books in bookstores and libraries and Occupy Wall St.’s library has a very nice vibe. “Your thin shoulders are for turning red under whips, / turning red under whips, and flaming in the raw cold. Your child’s fingers are for lifting flatirons / For lifting flatirons and for knotting cords. Your tender soles are for walking on broken glass, / walking on broken glass, across bloody sands. This was a departure from the advice Ezra Pound gave when Merwin visited him in St. Elizabeth’s Hospital for the Insane where Pound was incarcerated for twelve years as an outspoken and unapologetic political dissident. Pound said to get as close to the original form and language of the poem as possible. 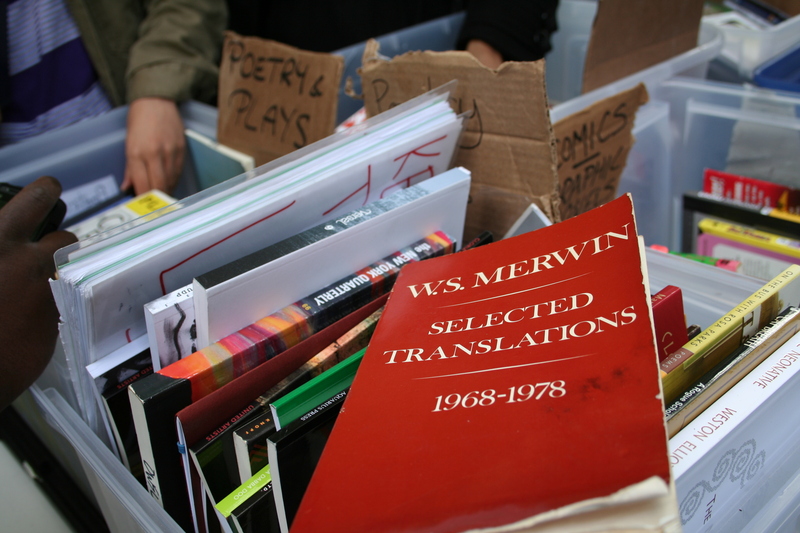 Merwin’s ‘possible’ is always infused with the music of the English language he writes in and colored by the music of the poets whose work he translates. The romance languages flow in English; the Mayan translations have the particular rhythm and magic of Mayan myth and syntax; the Asian poets resonate with exquisite imagery and rich symbolism. A delightful thing about rummaging in tubs of old books for something to read is the inevitable out-of-print gem you will find to taste and savor. 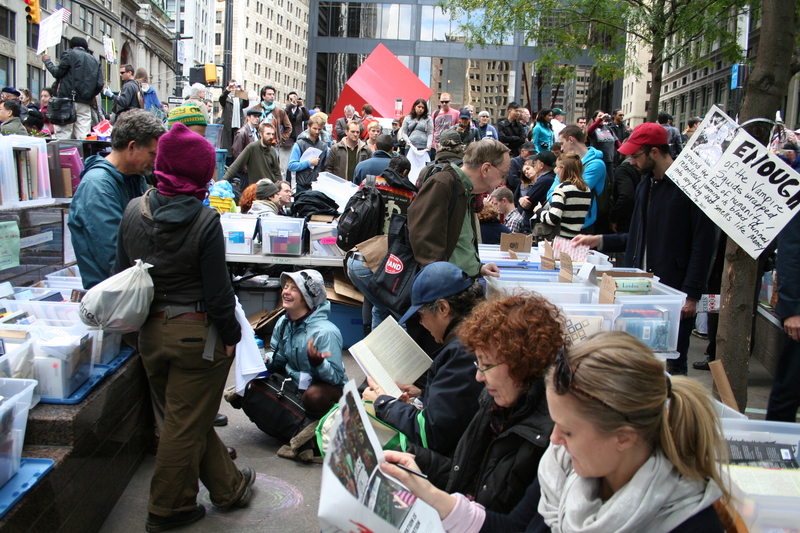 Despite the occasional high-energy chants, the constant jazz combo enlivening a nearby circle, the camera-wielding tourists and the difficulty of quiet reflection, you can read in the middle of an occupied park. And the words may make a different kind of sense to you—reading revolutionaries, rebels, nonconformists and passionate poets surrounded by a few yet to find their way into print.